Greenville, SC - The Greenville Road Warriors, proud ECHL affiliate of the New York Rangers and the AHL's Hartford Wolf Pack, today announced four players have been called up to Hartford for the club's run in the 2015 Calder Cup Playoffs. Forwards Josh Nicholls and Chris McCarthy, as well as goaltender Jason Missiaen, have all been reassigned to the Wolf Pack by New York. Defenseman Dallas Jackson has also been recalled by Hartford. Nicholls spent 53 games with the Road Warriors this season and finished third on the team in scoring (43 points) and second in goals (21). The 22-year old also amassed 22 assists, 20 penalty minutes and 171 shots during his second professional campaign. He was promoted to Hartford for the first time this season on November 22nd and recorded one assist in five games. A native of Tsawwassen, British Columbia, Nicholls spent the majority of last season with Greenville, where he finished fourth on the team in goals (20) and fifth in points (42) in 63 contests. He also played six games with Hartford. Prior to turning pro, the 6'2, 186-pound forward played five seasons in the Western Hockey League (WHL) with the Saskatoon Blades from 2008-2013. Nicholls was selected in the seventh round (#182 overall) by the Toronto Maple Leafs in the 2010 NHL Entry Draft. He is currently under contract with the Rangers. McCarthy made 63 appearances with Greenville this season and tallied 39 points (15g, 24a), 12 penalty minutes and a +7 rating. He also recorded one goal in five games with the Wolf Pack. Under contact with the Rangers, McCarthy made his professional debut last season and played eight games with Hartford following a stellar five-year career at the University of Vermont (Hockey East). In 2013-14, he earned the John C. Cunningham Award as the team's Most Valuable Player for the second straight season. A 6'1, 190-pound forward, McCarthy was also a member of the United States National Team Development Program (USNTDP) Under-18 Team in 2008-09. Missiaen, 24, went 18-15-3 with the Road Warriors this season and posted a 3.08 goals against average, .900 save percentage and two shutouts. His 18 wins led Greenville netminders and were the most in a single season for the club since he notched 22 victories in 2011-12. Spectacular in December, the fourth-year pro was named Warrior Hockey ECHL Goaltender of the Month after going 6-0-1 with a 1.41 goals against average, .957 save percentage and two shutouts in seven games. Missiaen was also named the CCM ECHL Goaltender of the Week for his performance Dec. 15-21. He went 4-0-0 with a 0.99 goals against average, .965 save percentage and two shutouts during four starts that week. A native of Chatham, Ontario, Missiaen was selected in the fourth round (#116 overall) by the Montreal Canadiens in the 2008 NHL Entry Draft. He is under contract with New York. Jackson, 26, registered 14 points (5g, 9a) in 23 games with the Road Warriors this season, and concluded the regular season on a four-game point streak (3g, 2a). A fifth-year pro out of the Western Hockey League, Jackson earned his first call-up to Hartford on November 2nd and produced 10 points (1g, 9a), 18 penalty minutes and a +4 rating in 43 contests. On January 4th, he was signed to an American Hockey League (AHL) contract after spending the first two months on a Professional Tryout Contract (PTO). Jackson spent all of last season in the AHL, splitting time between Bridgeport and Springfield. In 53 games with the Sound Tigers, the Edson, Alberta native recorded 24 points (3g, 21a) and 36 penalty minutes. 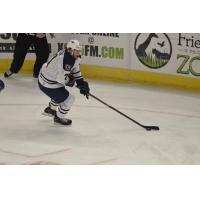 He added one assist and two penalty minutes in four outings with the Falcons. Follow: Keep up with the Road Warriors throughout the off-season and interact with other fans on the Official Road Warriors Facebook, Twitter, Pintrest and Instagram pages. For information on ticket packages for the 2015-16 season, please call a Road Warriors Account Executive at 864-674-PUCK or visit GreenvilleRoadWarriors.com/tickets-overview.html !